United States. Congress. House. Committee on Agriculture. 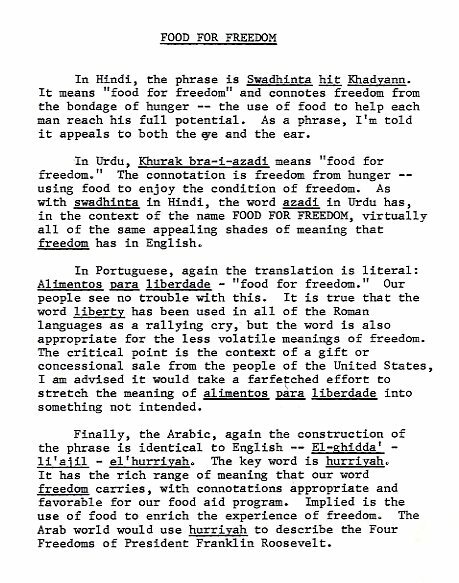 "'Food for Freedom' translated into Hindi, Urdu, Portuguese, and Arabic." Hyde Murray Papers, Box 111, File 560, Food for Peace Name Change, September 19, 1966, W. R. Poage Legislative Library, Baylor University, Waco, Texas.. Accessed 21 April 2019. http://acsc.lib.udel.edu/items/show/138. Hyde Murray Papers, Box 111, File 560, Food for Peace Name Change, September 19, 1966, W. R. Poage Legislative Library, Baylor University, Waco, Texas.